The Austrian Hockey League (also known as the Erste Bank Eishockey Liga, or EBEL) is the top-tier ice hockey league in Austria, although it currently features additional teams from Croatia, Hungary, the Czech Republic, and Italy. Until 2005–06, the league consisted solely of Austrian teams. Since then, the league has added teams from Slovenia (from 2006 to 2017), Hungary (starting 2007–08), Croatia (from 2009–10 through 2012–13, and again from 2017–18), the Czech Republic (starting in 2011–12) and Italy (starting 2013–14 season). The non-Austrian teams are competing for the "EBEL Champion" title. Only Austrian teams in this league are additionally eligible for the "Austrian Champion" title. The league has had different sponsors, and the current naming rights have been held by "Sparkasse Bank" and its Erste Bank brand since the 2003–04 season. The roots of the EBEL league go back to 1923 and various Championships, whose winner is officially recognized as the Austrian Champion. There was no Austrian competition between 1939 and 1945. During World War II, a number of Austrian teams competed in the German Ice Hockey Championship, which is why the EK Engelmann Wien and Vienna EV list German Championships in their history. The Bundesliga, as it was called, was incepted for the 1965-66 season by EC KAC from Klagenfurt, IEV from Innsbruck, WEVg from Vienna, and KEC from Kitzbühl. EC KAC won the championship 8 times in the 1970s. When the Austrian national hockey team earned promotion into the Group B of the IIHF, it led to a boom in spectators. 3 foreign players were allowed and first signs of financial hickups came. SV Kapfenberg went bankrupt, and WAT Stadlau abstained from participating in the Bundesliga for financial reasons. A first step in internationalization was undertaken as the clubs, additionally to the national championship, participated in the Alpenliga. Alpenliga was formed with clubs from Italy, Slovenia. After making Ralph Krueger their manager in 1991 VEU Feldkirch won 5 Championships from 1994-1998. Rising budgets caused more and more clubs to abstain from participation. In 1997 SV Kapfenberg went bankrupt during the season, and the championship had only four clubs. 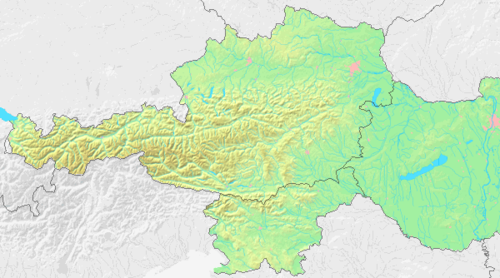 2000 VEU Feldkirch went bankrupt. The league was named after its sponsor, Uniqua. In 2003 Erste Bank became spnsor and the league was named EBEL. With their victory in the finals of the 2013/2014 season, HC Bozen became the first non-Austrian team to claim the league title. Formerly the best non-Austrian team result was when HDD Olimpija Ljubljana managed to get into the finals in the 2007/2008 season, losing the EBEL championship to EC Red Bull Salzburg. ^ "sport.ORF.at". Sport.ORF.at. Retrieved 2017-03-05. ^ "Znojmo to join Austrian EBEL". Eurohockey.com. 2011-06-06. Retrieved 2017-03-05. ^ "VSV-Sieg in rasantem "Winter Classic"". Sport.ORF.at. 2015-01-03. Retrieved 2017-03-05. ^ "KHL MedvÅ¡Ä?ak Winter Classic". Croatiansports.com. 2013-02-01. Retrieved 2017-03-05. ^ a b Šalata Winter Classic 2010., Croatian Wikipedia. ^ "VSV gewann Open-Air-Spektakel gegen KAC - oesterreich.ORF.at". Ktnv1.orf.at. Retrieved 2017-03-05. Wikimedia Commons has media related to Austrian Hockey League.